The Dry Tortugas National Park is located about 70 miles west of Key West, Florida. This cluster of seven coral reefs and sand islands, along with surrounding shoals and waters, make up the Dry Tortugas National Park. Ponce de Leon discovered these islands in 1513. 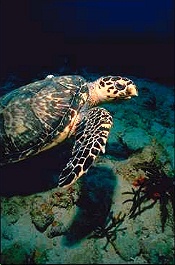 He named them Dry Tortugas for their absence of fresh water and abundance of tortoises. Dominating the Garden Key Island is Fort Jefferson. This fort is the largest of the nineteeth-century American coastal forts. 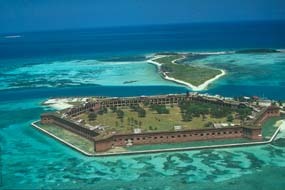 Fort Jefferson's construction began on Garden Key in 1846 and continued for more than 30 years, but was never finished. In 1935, President Franklin D. Roosevelt declared Fort Jefferson and the surrounding waters a national monument. In 1992, the area was designated as the Dry Tortugas National Park to protect the natural and historical qualities. Dry Tortugas is one of the country's more inaccessible national parks. Of the park's 64,657 acres, 99 percent is water and submerged islands.